With Big Data and Analytics becoming the buzzwords of the day, many students and professionals are curious to take the leap, but hesitate thanks to information overload. 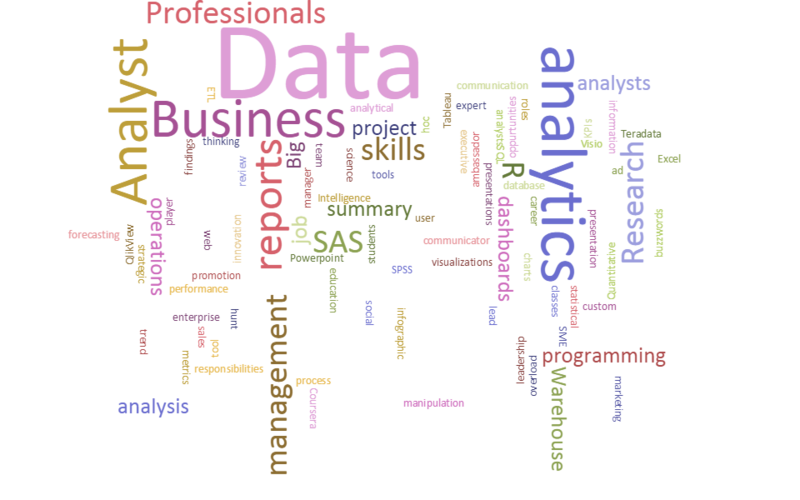 In this post, we see how business analysts can make a natural leap to this field, as many already have similar roles and responsibilities without the actual “data science” titles. I won’t talk about the actual work done by data analysts, but this page on the Villanova university does an excellent job of summarizing the facts. Identify the exact business problem and root cause: Analytics are used for two things only: (a) to solve a problem or (b) to improve processes. So, business analysts actually have a keen advantage in this area since this is our main role. The only difference is that we now derive the metrics ourselves to pinpoint the root cause and give recommendations or insights to clients and stakeholder. Also, a BA worth her salt will know how to investigate the “right” problem instead of chasing down an empty rabbit hole, and wasting hours on complex calculations for a metric that only seems important at face value. So which one to choose? Tough question, fortunately, an excellent infographic is provided by ZimanaAnalytics. Personally, I think SAS and R are both important. Statistics: You should be conversant with basic statistics concepts like mean, median, chi square test, ANOVA and hypothesis testing. Again, free online education platforms like EdX and Coursera have some great resources to help you master these topics. Data visualization and reporting: If you are a business analyst, chances are you already are familiar with making reports that summarize data analysis and recommendations for senior management. In my experience, I’ve seen many star professionals using R or SAS for the analysis part and then exporting to Powerpoint, excel or Visio for the actual charts, so you may already have these skills in your repertoire. Tableau is another great tool for fantastic visualizations, esp. since most big companies have an enterprise version for custom dashboards. Again, Coursera has excellent project based classes to help you get started on all of these, for FREE! Still not convinced or want more information? Read these two related articles by other authors to help you decide. Why business analysts make good substitutes for data scientists, by Chael Christopher, BI Consultant Lead to Fortune 500 firms. Forbes article and blog series on how to transition your career to analytics. Finally, my favorite post on How to become a Data scientist for Free, by Zeeshan, Founder of PredictifyMe, a predictive analytics company based in Research Triangle Park, North Carolina. Want free datascience projects with complete code? Check out my Projects page.